We are now two weeks into incubation. 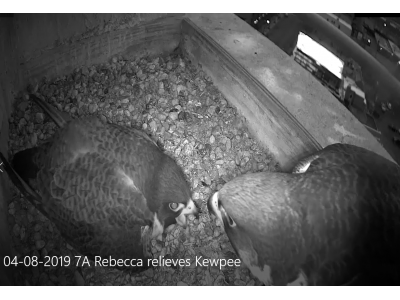 The Kalamazoo Peregrine falcons laid four eggs between March 22 and March 29 and have been diligent in incubation duties ever since. There is even a video clip of them exchanging places at 4 AM. There is a lot of ambient light in downtown Kalamazoo during the night, so their vision must be good enough to get around. This night time behavior is nothing new. We see them come and go from the nest box during the night very frequently. Despite some variation in the weather, they have not had to deal with as much snow and cold as some of our slightly more northern neighbors. The Grand Haven birds got quite a good amount of snow earlier in the week. Today in Kalamazoo, it has been in the 30’s and very windy and has started to snow this evening. And it sounds like we are in for a cold and wet week coming up.